Just back from Goa after spending a wonderful holidays. Wish I could extend my stay in my granny's house enjoying her mouth watering Goan dishes and spending the evenings near amazing and relaxing Goan beaches. School reopened today for my son and our lives are slowly getting back on track. 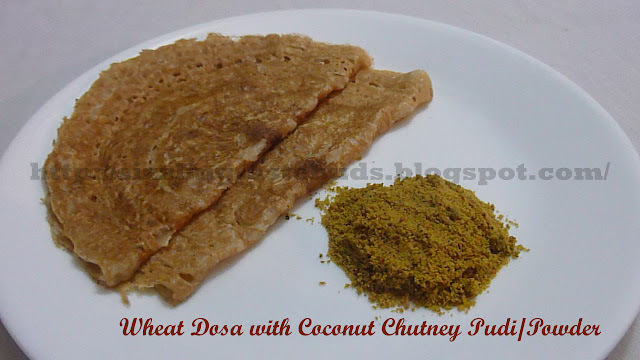 Since there was no time for me to soak rice and urad dal for idli's or dosa's and also I was left with no vegetables in the refrigerator, I prepared this Instant Wheat dosa and enjoyed the breakfast with the Coconut Chutney Pudi which I had prepared couple of weeks before. Will post the chutney pudi recipe soon. This is one dish which I often prepare. Guess why? Any guess ....Its simply because its ready within minutes...hahaha...Bad joke. But seriously its very simple and healthy dish with very less ingredients and bachelor's special dish after Maggie Noodles. So here's the quick recipe for this super fast Instant Wheat Dosa. 1. Mix all the ingredients to a smooth dosa batter consistency. 2. Heat the dosa pan and grease it with little oil. 3. Take a laddle full of batter and pour it on the dosa pan spreading evenly. 4. Cook for a minute or two and turn the dosa to cook other side. 5. Serve hot with any kind of chutneys ( click on the link for recipes) or chutney pudi.